The Touran is a real Jekyll and Hyde kind of car. You think it’s a boring little bus. Actually it is a really brilliant multi purpose vehicle. The interior is excellent in typical VW style. The ride is very good and the handling and performance is surprisingly good, in normal driving very similar to the Golf 5. Having lived with it for a week I can summarise it as having the fun and interior comfort level of a Golf with the space of a small van. A Golf on space steroids? The Touran is, like the Mazda5, more car than van. It is a very different proposition from the Caddy which we are also reviewing. 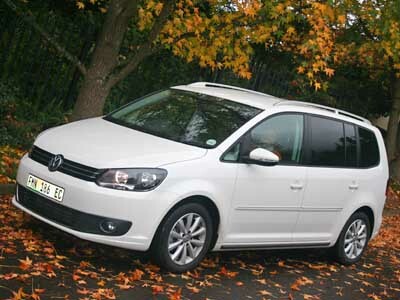 The Touran is a five seater, with two extra seats suited to younger children available as an optional extra. A very roomy and versatile car. The competition includes the Renault Scenic, Toyota Verso, Mazda5 and possibly the Nissan Grand Livinia. We drove the 1.4STi petrol model which produces 103kW @ 5 600 rpm and 220Nm fron 1 500 to 4 000 rpm. Performance is sprightly. VW claims 6.8L/100 km and a top speed of 202km/h but we got around 7L/100km. The 2.0 DTi diesel gets around 5.5L/100km and delivers torque of 250 Nm from around 1 750 rpm and costs around R300 000. We loved the interior. The seats are just right, have good lumbar support and are trimmed in Alcantara. There are many storage spaces and nooks and crannies. This car has space. The Highline variant comes with dual-zone aircon, privacy windows as well as the leather full function steering wheel, gear knob and handbrake lever that comes standard with all models, as does rain sensor, cruise control and sound system. All the models have daytime running lights, six airbags, ESP with ABS, EDS, countersteer assistance and brake system. The Highline adds, fog lamps, cornering lights and full spare wheel. All Tourans come with 3 year 120 000km warranty, 15 000km service intervals and 5 year 90 000 service plan.